Rail siding is nothing new and is an ever-increasingly popular form of logistics. Yet, many new to business logistics and outside the industry are unfamiliar with what rail siding actually is. Rail is one of the oldest and most reliable forms of transportation to date. Rail siding takes advantage of the mainline railways by having low-speed branch sections of track that are laid along large warehouses with convenient access to the railroad. These warehouses have slots and bays that allow trains the ability to pick up and drop off entire rail cars with minimal stopping time before returning to the mainline. 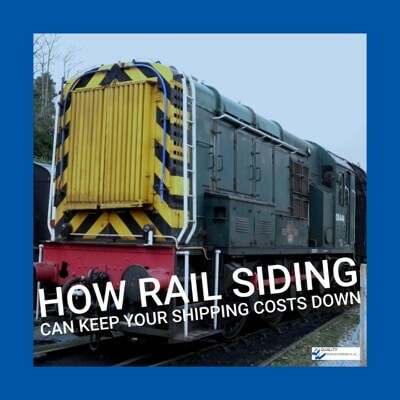 Now that you know what rail siding is, here are some ways it can keep your shipping costs down and the advantages it has for your business. We have all seen those massive tractor trailers moving goods on busy highways and streets. These trucks cost a great deal of money to keep them moving: Oil changes, tires, brakes, and other maintenance items are costly and drive shipping prices up. Not to mention, each of these trucks has a driver that needs to make a profit for his or her time. And then there are fuel prices. These trucks guzzle fuel, which means that rising gas prices are passed on to the customers hiring them to move their goods. Rail, however, doesn’t use the same fuel source, one engine can move far more rail cars than a fleet of eighteen-wheelers, and rail requires less staff. This makes transporting by rail far more cost-effective and efficient. It is no wonder rail siding is a preferable method of logistics based on cost alone. Another great advantage of railroad siding is that train cars can be adapted to move almost any type of product. They are not as limited to the same size and weight restrictions of goods being moved by roadways or air. The adaptability of rail cars combined with the power of a locomotive engine means all types of goods can be transported in bulk. The ability to move product in bulk drives shipping costs down, and those lower prices are passed on to you and the consumer. These bulk shipments can also be combined with different product classes. This means a single train can move cars with completely different product types at the same time without the worry of cross contamination. Rail-siding transportation makes this possible. Rail-siding transportation is one of the most precise and consistent forms of logistics when it comes to scheduling. Trains are almost always on time. Their tracks and movements make them highly predictable and almost always on schedule. You don’t have to worry about your shipment getting stuck in a traffic jam or arriving late due to weather conditions or various other reasons. Rail-siding shipping is an efficient practice that allows trains to pick up rail cars quickly and drop them off just the same. This means the train can keep moving on schedule while rail cars are left at the rail-siding warehouse for loading and unloading. The train simply pulls up and makes the car exchanges quickly without the need for extended load times. Time is money, and when you can count on your products shipping on schedule, you save both time and money. That means you can make greater profits and lower prices to pass the savings along to your customers. When you are efficient and saving time, everyone wins. It is easy to see the benefits of a rail-siding company and how it can keep costs down for you and your business. It is no wonder why shipping by rail has stood the test of time and continues to grow in popularity and reliability. Let us help meet your logistical goals by considering rail-siding warehousing and shipping to maximize the shipping efficiency of your business.